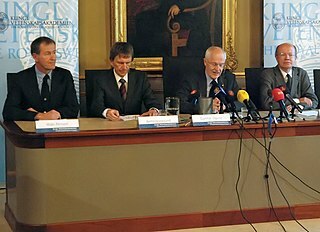 The announcement of the 2008 Nobel Memorial Prize in Economic Sciences in Stockholm. The winner of the prize was Paul Krugman. ↑ "Nomination and Selection of the Laureates in Economics". Nobel Foundation. Archived from the original on 2008-07-15. Retrieved 2008-10-15. 1 2 "The Sveriges Riksbank Prize in Economic Sciences in Memory of Alfred Nobel 1969". Nobel Foundation. Retrieved 2008-10-14. ↑ "The Nobel Prize". Nobel Foundation. Retrieved 2008-10-15. ↑ "The Nobel Prize Award Ceremonies". Nobel Foundation. Archived from the original on 2008-08-22. Retrieved 2008-10-07. ↑ "All Laureates in Economics". Nobel Foundation. Retrieved 2014-10-17. ↑ "Nobel Laureates of UChicago". The University of Chicago. Archived from the original on 2012-09-08. Retrieved 2018-10-10. ↑ "The Sveriges Riksbank Prize in Economic Sciences in Memory of Alfred Nobel 1970". Nobel Foundation. Retrieved 2008-10-14. ↑ "The Sveriges Riksbank Prize in Economic Sciences in Memory of Alfred Nobel 1973". Nobel Foundation. Retrieved 2008-10-14. ↑ "The Sveriges Riksbank Prize in Economic Sciences in Memory of Alfred Nobel 1976". Nobel Foundation. Retrieved 2008-10-14. ↑ "The Sveriges Riksbank Prize in Economic Sciences in Memory of Alfred Nobel 1978". Nobel Foundation. Retrieved 2008-10-14. ↑ "The Sveriges Riksbank Prize in Economic Sciences in Memory of Alfred Nobel 1980". Nobel Foundation. Retrieved 2008-10-14. ↑ "The Sveriges Riksbank Prize in Economic Sciences in Memory of Alfred Nobel 1981". Nobel Foundation. Retrieved 2008-10-14. ↑ "The Sveriges Riksbank Prize in Economic Sciences in Memory of Alfred Nobel 1984". Nobel Foundation. Retrieved 2008-10-14. ↑ "The Sveriges Riksbank Prize in Economic Sciences in Memory of Alfred Nobel 1986". Nobel Foundation. Retrieved 2008-10-14. ↑ "The Sveriges Riksbank Prize in Economic Sciences in Memory of Alfred Nobel 1992". Nobel Foundation. Retrieved 2008-10-14. ↑ "The Sveriges Riksbank Prize in Economic Sciences in Memory of Alfred Nobel 1994". Nobel Foundation. Retrieved 2008-10-14. ↑ "The Sveriges Riksbank Prize in Economic Sciences in Memory of Alfred Nobel 1995". Nobel Foundation. Retrieved 2008-10-14. ↑ "The Sveriges Riksbank Prize in Economic Sciences in Memory of Alfred Nobel 1997". Nobel Foundation. Retrieved 2008-10-14. ↑ "The Sveriges Riksbank Prize in Economic Sciences in Memory of Alfred Nobel 1998". Nobel Foundation. Retrieved 2008-10-14. ↑ "The Sveriges Riksbank Prize in Economic Sciences in Memory of Alfred Nobel 1999". Nobel Foundation. Retrieved 2008-10-14. 1 2 "The Sveriges Riksbank Prize in Economic Sciences in Memory of Alfred Nobel 2000". Nobel Foundation. Retrieved 2008-10-14. ↑ "The Sveriges Riksbank Prize in Economic Sciences in Memory of Alfred Nobel 2001". Nobel Foundation. Retrieved 2008-10-14. 1 2 "The Sveriges Riksbank Prize in Economic Sciences in Memory of Alfred Nobel 2002". Nobel Foundation. Retrieved 2008-10-14. 1 2 "The Sveriges Riksbank Prize in Economic Sciences in Memory of Alfred Nobel 2003". Nobel Foundation. Retrieved 2008-10-14. ↑ "The Sveriges Riksbank Prize in Economic Sciences in Memory of Alfred Nobel 2004". Nobel Foundation. Retrieved 2008-10-14. ↑ "The Sveriges Riksbank Prize in Economic Sciences in Memory of Alfred Nobel 2005". Nobel Foundation. Retrieved 2008-10-14. ↑ "The Sveriges Riksbank Prize in Economic Sciences in Memory of Alfred Nobel 2006". Nobel Foundation. Retrieved 2008-10-14. ↑ "The Sveriges Riksbank Prize in Economic Sciences in Memory of Alfred Nobel 2007". Nobel Foundation. Retrieved 2008-10-14. ↑ "The Sveriges Riksbank Prize in Economic Sciences in Memory of Alfred Nobel 2008". Nobel Foundation. Retrieved 2008-10-14. 1 2 "The Sveriges Riksbank Prize in Economic Sciences in Memory of Alfred Nobel 2009". Nobel Foundation. Retrieved 2009-10-12. 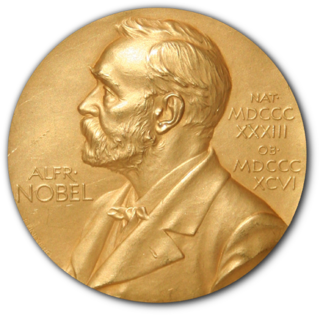 ↑ "The Sveriges Riksbank Prize in Economic Sciences in Memory of Alfred Nobel 2013". Nobel Foundation. Archived from the original on 2017-06-02. Retrieved 2016-07-01. ↑ "The Sveriges Riksbank Prize in Economic Sciences in Memory of Alfred Nobel 2016". Nobel Foundation. Archived from the original on 2016-10-10. Retrieved 2016-10-10. ↑ "The Sveriges Riksbank Prize in Economic Sciences in Memory of Alfred Nobel 2017". Nobel Foundation. Archived from the original on 2017-10-02. Retrieved 2015-10-09. ↑ "The Sveriges Riksbank Prize in Economic Sciences in Memory of Alfred Nobel 2018". Nobel Foundation. Retrieved 2018-10-08. "All Laureates in Economics". Nobel Foundation . Retrieved 2008-10-14.